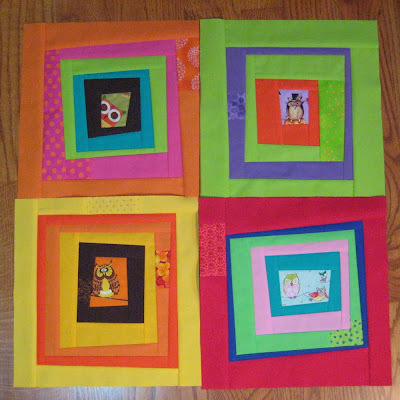 and near the bottom I'll put a strip containing the name of the quilt- "Hooters!" The fabric the word strip is sitting on is actually my binding fabric. I found a website with tutorials on building these letters, no paper piecing involved, just some sewing and trimming and pressing! It was great fun and very quick. Once the back is made, I'll sandwich them together with some cotton batting in the middle, pin and then quilt using the sewing machine. I have to say, I'm not looking forward to the quilting. 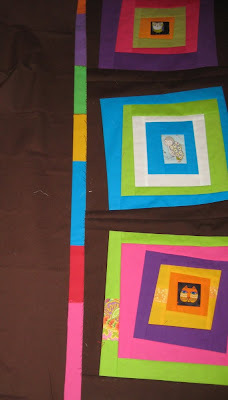 I keep saying "no more big quilts" because I don't enjoy wrestling with it while quilting, but I can't hardly bear to force myself to make little wall-sized quilts. I need to be making placemat sized ones, but I can't seem to help it, I've always thought bigger was better and that more is more! I debated sending it off to be quilted but I don't want to! I mean, I do, but I don't.... seems like it wouldn't be MY quilt if I did that. So to force myself to do it, I bought a pretty variegated thread today by Superior, King Tut line- the color is Cleopatra and ought to look great on the brown and the brights. It has lime, red, orange, aqua and purple in it and it changes color every inch! I hope I like working with it, I've never used this brand before. I bought 2 spools of the 500 yard size as I seem to use a lot of thread when I quilt. Here's a close up of some of the newer blocks, before they were sashed with chocolate brown. 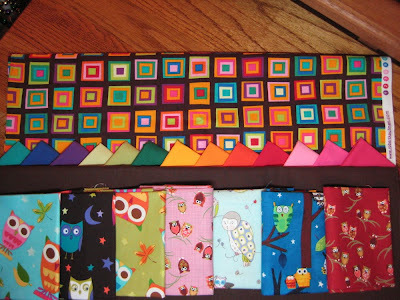 I kept coming across new owls and just HAD to have them for the quilt- see the top right and bottom left? They are SO cute. Both were in Halloween fabric but they worked out fine. So maybe one of these days I'll get this thing finished, but it sure has been colorful and fun to work on! 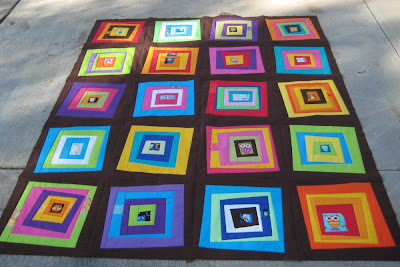 Many thanks go out to QuiltDad- John, who was our teacher for this quilt. I couldn't have done this without you, man! Thanks a whole, big bunch! LOVE IT. It looks great-well done. love love love it. I prefer to handquilt all my own quilts, but there gets to a point where you just want to keep sewing and there's no way you can quilt everything yourself. So I've had some longarmed - still feels like my quilt. It's all my own fabric choices and blocks.